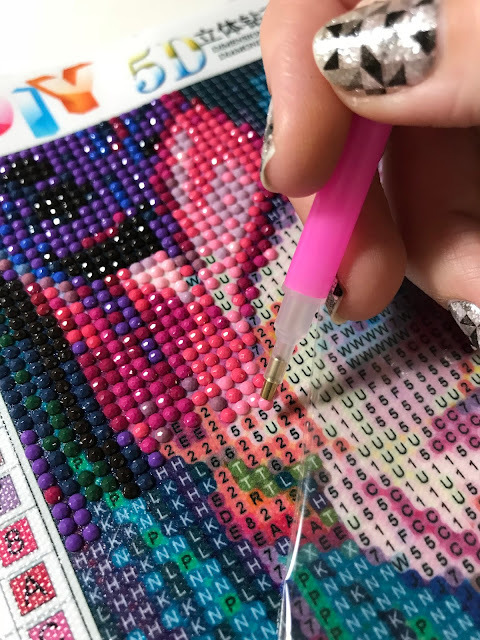 A Vegas Girl at Heart: Diamond Painting? Last week a user on Instagram introduced me to something I'd never heard of - Diamond Painting! I had to look up what this was. 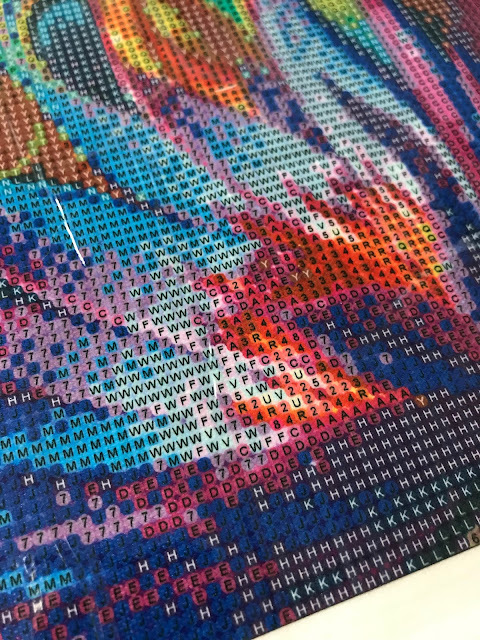 Basically, you have a canvas similar to a paint by number or cross stitch, but you place little gems in the spaces. I think the gems are referred to as diamonds because they have facets that make them sparkle in the light. I found a whole bunch of kits on Amazon and settled on this Lotus pattern one. It was under $9 with free Prime shipping, so I figured it would be a good starting print to see if I liked the idea. And boy do I love it! The kit is simple - it comes with a sticky canvas covered in plastic (you gently pull the plastic away as you work - keeping it attached so you don't lose the stickiness. And it comes with bags of gems that are numbered so you know which colors to put in which spot on the canvas. The canvas has little squares exactly as you do on a cross stitch or paint by number. 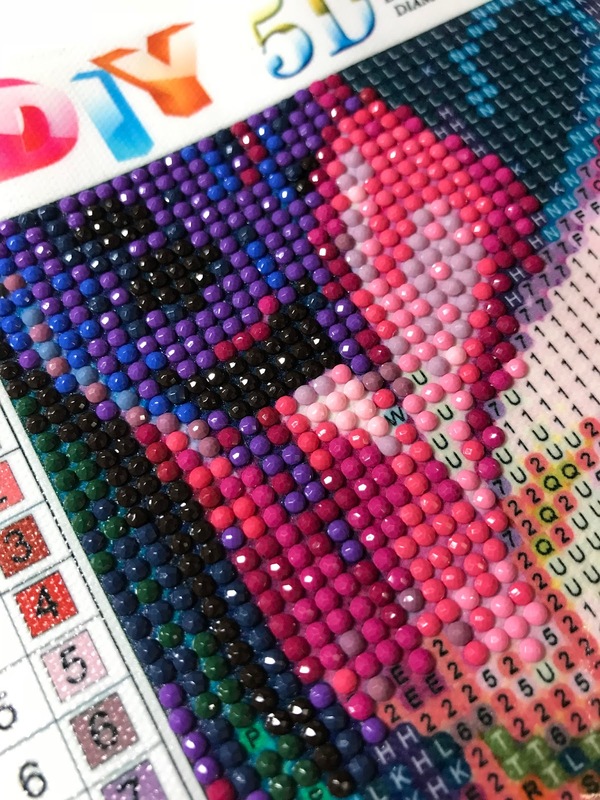 To actually create the painting, you take the little gems and put them on the squares using this tool. 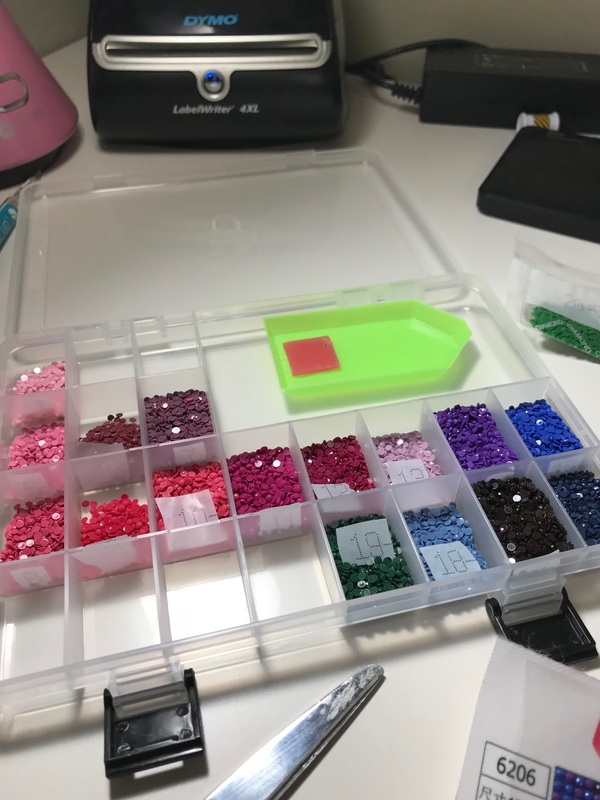 This is basically a little hollow metal end that you stick wax into (which comes with the kit), and that sticks to the gems so you can pick them up and place them onto the sticky canvas. You could also use one of the Silhouette Pick-Me-Up tools or a jewel picker. I just found the one that came with the kit easier than the PMU tool. I have only done a small section of the canvas but I absolutely love this. It's relaxing and fun, and so simple to do. I already have a bunch of other patterns on my Amazon wish list. I did read the reviews on this one and it seems one of the colors may come up short for some folks, though other folks said they had plenty of gems to finish, so we will see. But for under $9 I figured if I have to use a few extra gems of a different color, I was ok with that. When I finish, I will update the blog with a final photo and let you know if I had any issues with the number of gems. This is the Lotus print I got and I think I'll be hanging it in my craft room, but I really love this Coffee print (I'm thinking for next to my coffee station in my kitchen), and then I like this Lighthouse one for our bedroom which has a beach/sea theme. There are SO many kits on Amazon! Lots with free Prime or regular shipping too. 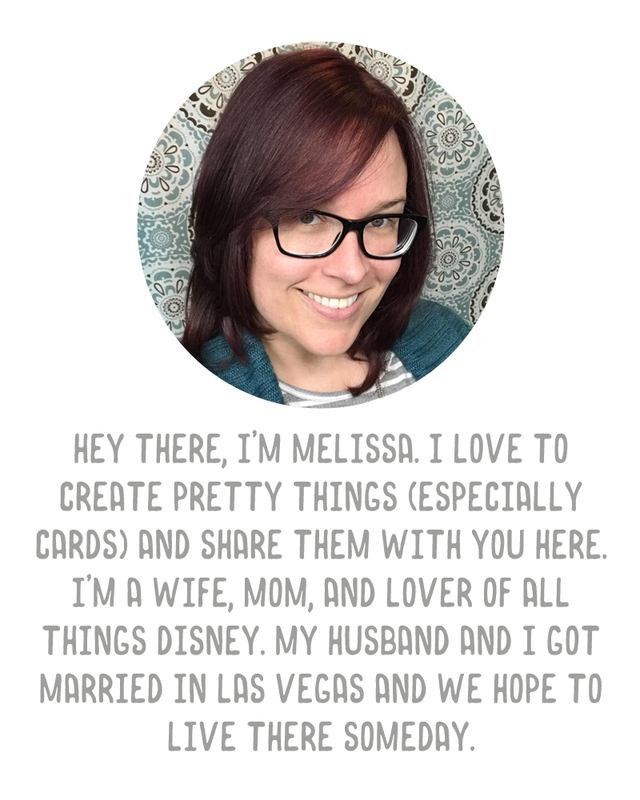 And I did see some websites in my searching where you can get custom ones, so I may do some of those in the future. Be sure to check out #diamondpainting on Instagram too! Lots of pretty results! Oh, and for the little jewels - it is best if you have some tiny jars or bead storage containers. I just poured mine into this empty bead storage container I had and I cut the little numbers off the packages and stuck it inside each slot so I know which is which. I've seen where people label little jars with numbers as well. I didn't have enough slots in this tray so I am using a second one as well for the remaining numbers.